This Halloween, dare to play (and maybe even stay) with the hysterical spirits of the great Cariboo Gold Rush! On Sunday, October 31st, Barkerville Historic Town will roll out the dead carpet for any soul brave enough to wander the wooden boardwalks of British Columbia’s largest – and, some would say, most haunted – heritage site. 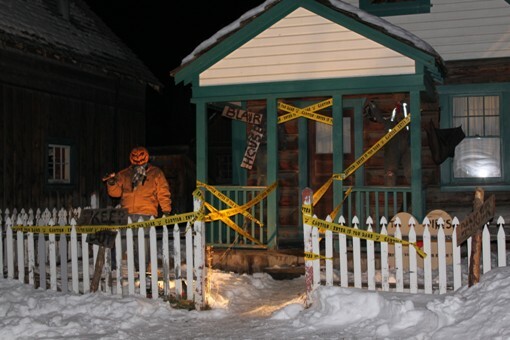 Each year on October 31st Barkerville Historic Town throws a community Halloween party for local residents of British Columbia’s Central and Northern Interior regions. Admission to the evening is by donation (with a suggested donation of $5.00 per person) and over the past few decades the annual event has grown increasingly popular. 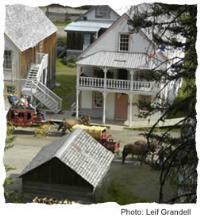 Barkerville’s traditional ‘Ghostly Town Tour’ will begin at 6:30 pm on October 31st. The walk will explore the shadows of Barkerville’s main street after-dark, where monstrous Jack-O’-Lanterns, traceless spirits, and the secretive pasts of Barkerville’s most notorious residents sometimes lurk. For the bravest of the brave the ‘Blair House of Horror’ Haunted House is a must-see experience. Hot dogs, treats and other refreshments will be provided at the Visitors Reception Centre, prizes will be awarded for Best Costume, and a spook-tacular fireworks display will guarantee the evening ends with a bang. This year, guests who want to meet some of the ‘real’ ghosts of Barkerville’s hair-raising past can book an unforgettable night at the St. George B&B – Barkerville’s famously ‘haunted’ hotel. For more information or to reserve the ‘haunted room’ call 1-888-246-7690, or visit www.barkerville.ca/barkerville_halloween.htm. Halloween is one of the oldest celebrations in the world, dating back over two thousand years. The ancient Gaels believed that on October 31st the boundaries between the worlds of the living and the dead overlapped, and that the deceased could come back to life. Traditional activities of this holiday include trick-or-treating, bonfires, costume parties, visiting ‘haunted houses’ and carving Jack-O’-Lanterns. Today, Halloween is celebrated in many countries and regions of the world including South America, Europe, Japan and other parts of East Asia.